Can you do a post on professional attire for bike commuters with minimal resources? There has to be a better way than my bursting waterproof backpack, folded blazer, messy hair, and muddy shoes. – Keep dress shoes clean. – Managing sweat, rain, etc. – Keeping my suit/dress clean. – No cabinets to store spare clothes, hair tools, etc. – Bike stays at a public outdoor park & ride so I must carry all my saddlebags & supplies all day. It’s been quite a while since we’ve talked about biking to work (we’ve also discussed more specific topics like backpacks for commuting, how to stay cool on your commute, and how to lighten your load), so today we’re sharing advice from me — a lawyer in a midsize Midwestern city who rides a bike for exercise and occasionally commutes to the office by bike — and Corporette® reader (and CorporetteMoms writer) April, who has commuted to work on bike both in NYC (because it was faster than public transit) and to the train in New Jersey (both for the exercise and to enjoy the outdoors). “Safety is number one,” says April. “ALWAYS wear a helmet, learn the rules of the road, don’t bike with headphones in, yield to cars, always assume cars CAN’T see you, anticipate pedestrians stepping off curbs, attach a bell to warn people or don’t be afraid to use your voice.” Speaking of yielding to cars, I still remember the season of The Real World that featured a bike messenger — it clearly showed that car doors can be a bike rider’s worst enemy — and I still get nervous when passing parked cars, just in case the person inside decides to open the door into the bike lane without looking first. Even though bikes can range in cost from a couple hundred dollars into the thousands, most bike accessories with safety in mind are extremely affordable. Bike bells start at about $5 at Amazon, and lights available as a set of front and rear for as low as $24, according to this roundup from Bicycling. Of course, like any sport or hobby, there are more expensive versions of these accessories, as well as GPS guidance and cameras. Meanwhile, I appreciate my single-speed. 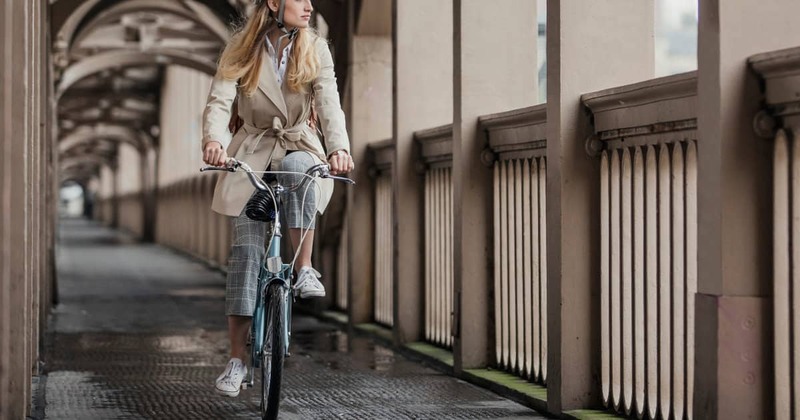 Compared with a previous mountain bike, it’s extremely light for long rides around town, but it wouldn’t necessarily be an ideal commuting bike with its high bar and limited space to add a basket or other accessories to carry extra gear to or from the office. But for someone more used to this kind of bike, it’s good for a workout on mostly level, smooth surfaces during dry riding conditions. If you’re not sure which type of bike is right for you, there are several factors to consider, including cost, your comfort level on different styles of bikes (high bar, low bar, kickstand, no kickstand, tire tread, etc. ), and what accessories are already included (or can be easily added). The best way to know if a bike is a good fit is to ride it for yourself. If you have a bike shop in your area, they’ll be able to best match you to a bike and might provide you with a loaner. They might also have good suggestions on where to find the best path — whether it’s via bike lanes or less-traveled city streets. However, there are also several bikes available to ship directly to your home on Amazon and other outlets. Some brands even include deals with local bike shops who’ll put the bike together and adjust it for you if you don’t feel comfortable assembling it yourself. “The locking was one of the biggest sources of anxiety for me, both in the city and leaving my bike at the train station all day,” says April. “If my bike were to ever be stolen, I could walk home from each commute, but if you’re biking farther than walking distance, then be sure to have a backup plan.” It’s worth noting that it may also be an option to bring your bike (or part of it, like a wheel) into your office with you. To learn about your options for bike parking, check with your office’s building manager to see if there’s a private space to store your bike, or if it’s OK to keep it in your office. Some cities even have gyms that cater to bike commuters by offering bike valet services, while some parking garages offer areas that are reserved for bikes. 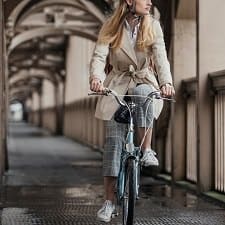 It’s easier if you can just “dress on the casual side of business casual,” like April suggests, but the articles about bike commuting we’ve included below suggest either bringing an outfit in your bag to change into when you get to the office, or keeping a spare outfit at the office just in case. 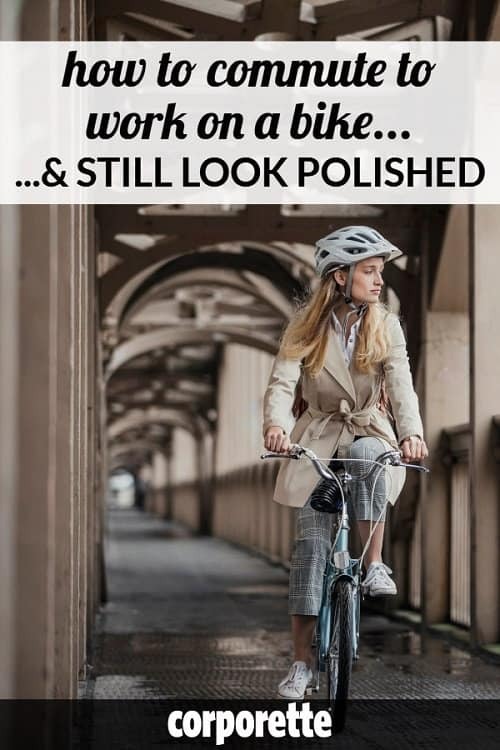 It’s also a good idea to wait until you get to the office to apply makeup (or choose waterproof makeup for your bike commute). Because of the extra time it’ll take you to freshen up, it goes without saying that you’ll have to plan extra time for the commute. There’s also the option of bringing some face wipes (or whatever you prefer to wash your face) for a quick clean-up when you get to work. Readers, what are your thoughts on how to commute to work on a bike? If you’ve thought about riding to work on a bike for a while but haven’t yet, what is holding you back? If you’ve already been commuting to work on a bike, how’s it going? What have you been glad to have done — or wish you had done differently? What part of biking to work appeals to you the most — the exercise, the environmental benefit, or a hatred of other commuting options like long drives in traffic or hot, overpacked subway cars? Pictured: Deposit Photos / DGLimages. I am also in a midsized midwestern city (government employee). My commute is 10 miles so I do a short bike to my bus stop and put my bike on the bus to get to work, wearing my work clothes/hair/makeup. In the summer I prefer longer skirts or ankle-length skinny pants. I pack a pannier with my change of clothes for the bike ride home. Our office does have lockers and a shower for those who more actively bike in (or use the small on site gym). If you attach accessories (lights, bells, etc) with velcro, it’s a good idea to remove these items before locking the bike in a public area. My DH has had many more permanently-mounted items stripped from his bike while it’s parked. I love this question! I’m in Silicon Valley and have biked to work both in-house and in big law. Biking is pretty popular and respected around here. -it doesn’t have to be complicated. Go to a good bike shop and get a bike that’s comfortable for you along with the bare minimum of accessories (bike lock, lights, helmet). The bike shop can advise on an appropriate lock for your area and the best value on lights. You can get a kick stand, fenders, et cetera later if you want them. -For rainy weather, just wear rain pants and a rain jacket. Rain boots can also be helpful. A fender isn’t going to do much for you. -I would sometimes bike in a pencil skirt and heels, though my clothes didn’t last as long. If you’re going to be biking for long enough or in hot enough weather that you’ll get sweaty, bring a change of clothes and maybe baby wipes or deodorant. -Timbuktu messenger bags are good for biking (even in the rain) and look decently professional, at least in my area. -If you have kids to cart to daycare, you can still bike! I adore my cargo bike designed for hauling kids around. Get panniers. I have the Po Campo removable tote pannier. The magnets are super secure, and it’s pretty roomy. I can fit basic purse items, lunch, coffee, and a change of clothes/shoes, though all of that is a fairly tight fit. I love it and highly recommend it, but there are tons of other options. Wearing a backpack while riding makes me sweat quite a bit more than using a pannier bag. Oh, actually, since I bought this bag, they’ve come out with a backpack pannier bag that looks even roomier. That might be a good solution for Reader M. I particularly like the straps for your helmet. I bike commuted for a few years in Seattle. Given the rain situation there, I just had to bring my work clothes in my saddlebag and change at work. So on days when I needed to wear a suit, I typically took the bus instead. I had a big, sturdy Ortlieb bike briefcase that clipped onto my rack, which would hold a laptop and also my clothes and shoes (I also kept a lot of dress shoes at work). The key to not getting sweaty was generally riding at a relaxed pace, and baby wipes for minor clean-up. Also, I’m a huge advocate for daytime running lights. A lot of cyclist safety advice annoys me because it’s not backed by science (i.e., wearing hi-viz/reflective gear isn’t actually particularly helpful and in bright light, may make you harder to see) but daytime running lights do make a measurable difference in helping cars see you, especially in semi-dark situations (overcast days, twilight, roads with a mixture of sun and shade, etc.). I biked to work once sometimes at my old office in a medium-sized town that was very much car friendly. My drive was 10 minutes or less. I did it for exercise. I would take my clothes for the week in on the weekend and then change after I got there. I didn’t bike every day so would take them home at the next opportune time (most of it I wanted to hang back up instead of squish into a backpack). I would put underclothing and makeup in my backpack and bring them with me daily. Shoes were hit or miss – either carry them or wear one of the many pairs that permanently lived in my office. Wear whatever you will wear in the office (plus a waterproof mascara), bike just below the speed that makes you start sweating. The only clothing restriction is pencil skirts – you need two slits in the back or sort of a flap. I wear rain pants and rain jacket when necessary (and rain boots if it is an extreme downpour). Now, how to bike in high heels without getting this nasty stripe at the sole of the shoe? Anyone have advice for curly hair? I feel like I can never get over the smoosh of my helmet and my hair looks bad all day (frizz, flat on top and curly on bottom, generally looks disheveled or like I did a bad job defining the curl). I’m not at a point where I can do a full ponytail because of length and I’m not going to straighten my hair. I’m not sure if the best approach is to dampen my hair after arriving or if there’s a magic cure I’m unaware of. Wear it half-up? Mine’s curly but it’s long enough to wear in a pony-tail when I bike. If I do that and bike slow, I don’t get helmet hair. Although I give up entirely on biking in summer because Houston and I’m not that masochistic. Spray bottle with water to lightly wet it, scrunch, followed by some sort of texturizing spray (Bumble Surf Spray is a good one). Either dampen your hair or see if you can kind of tuck it all inside the helmet. I twist my curls and then pin them back with bobby pins, then put the helmet on. Works fine enough. I’ve started biking to work a couple of days a week this summer, weather/ schedule dependent, when road construction doubled my commute time. It is 18 miles round trip – mostly on trails. Fortunately our building has a gym and shower. In the morning I get up have some coffee and put clothes in a back-pack for the day. It helps that our office has gone casual. But I do think ahead as to what to wear. My getting ready is minimal – tinted moisturizer, mascara and red lipstick. My DH purchased and installed bike lights for additional safety. I very much enjoy the bike ride in the morning – feels great walking in energized to tackle the day. Afternoon is a nice wind down from the day. I would love to bike to work, and there are CITI Bike’s nearby, but guess what, it is New York City, and the cabs and people just do NOT respect people on Bike’s, especially a woman like me. As it is, when I do bike on weekends, men are always talking about my shelf, and that is when I wear shorts. I can NOT imagine wearing anything nice on a bike, and dresses are out! So for us NYC professional women, biking to work is just NOT an option. Of course it may be different if you work for some jobs in Civil Service, where it does not matter what kind of clotheing you wear. You MUST in any event remember to be fresh–the last thing any one of needs to do is to come in smelley! FOOEY on that! If you’re going to be parking your bike in an outdoor, public area, make sure you purchase and correctly use a U-lock. (The bike shop where you purchase it can show you how to affix it to your front wheel and frame.) Every person I know who has had a bike stolen was using a cable lock. I asked the salesman who recommended a U-lock to me if it was really necessary, and he told me they had a contest at his store to see who could break through a cable lock the fastest. Even with the heavy duty chain cables, it took them less than 15 seconds with a decent pair of bolt cutters to snap it. Spend the few extra dollars and get something that will deter thieves! Before I had kids I used to bike 7 miles to work. I work in the arts, and the dress code is pretty forgiving – no suits, or sheath dresses, or heels. Most days I wear jeans, khakis, or a skirt and a cotton top (not button down). Sometimes I wear tunics and leggings. So not sure how helpful my experience will be, but: I would bike in my bottoms and shoes for the day and a t-shirt and sports bra. If the weather is cold, I’d layer a windbreaker (though if it’s rainy, it’s a toss up if I would rather be wet from sweat since the windbreaker doesn’t breathe, or wet from rain, usually the latter won out). When I get to work, I would head to the bathroom, wipe down with baby wipes, swipe on deodorant, change bra and top, fluff or tie my hair back in a tight ponytail and be ready for the day. The babywipes and bra were key. Re: the Curly Hair question- get a hair wrap or use a Buff-style tube, and just lightly cover your curls. The fabric will provide a barrier between your head and the helmet, and then at your destination, just fluff it all out. When my hair is feeling curly, I put my helmet on over my hairwrap before I adjust the helmet, and then I snug up the straps and finally tighten the helmet. Women of color who wear their hair in various styles may want to consider more than one helmet of two different sizes to accommodate hair sizes. I often ride to work in my work clothes, and ride home in workout clothes. But it’s all dependent on weather!! If it’s hot or humid, I wear workout clothes both ways and change at work. I have a shower room now, but never did before- I would do baby wipe showers in the bathroom. In warm weather, you might also want to leave or arrive a little earlier to give yourself time to cool down. I have a short, flat ride (2 miles), am able to keep suits/shoes in my office, and store my bike without a lock, so this may not be as helpful. But I have a few things that really improve my daily bike commute experience: (1) I find TWO baskets to be key on days when I want to bring home files/computer, or bring in lunch, or schlep other work stuff. One on front and one on back. I put a strap through the front corner of the front basket where I can put my coffee in the morning without it falling over. (2) Lights, especially on the back, if you are commuting in the winter months. (3) Summer and winter helmet. The summer helmet has a lot of holes/aeration. The winter helmet is very solid. Makes a big difference in staying cool or warm. (4) If biking in the winter, buy actual biking gloves and pants. They will keep you warm. I wear tights and my work blouse, then put the pants over, jacket, warm infinity scarf, etc. Then I just change into my work skirt at work. In the summer, I wear a machine washable midi length A-line skirt while biking and then change into suit skirt at work. I am able to bike commute almost year round in my four season city. I won’t ride if there is snow on the ground, if it is below around 20-25 degrees, or if it is truly pouring rain in the morning (I don’t mind in the evening because I can just change when I get home). I realize this sounds like a lot of work but I love that I don’t pay for parking, I have a really pleasant, fast commute, and I don’t get aggravated by stupid drivers and traffic. I was “doored” once, but wasn’t going fast and didn’t have any serious injuries. Seconding the bike basket part x100. I get too sweaty using a messenger bag or backpack, and my pannier was bulky and something I always had to carry into the office or anywhere else I might go after work. I have a fairly deep basket that sits on my rear bike rack and fits a large briefcase/tote. When I used the pannier it wasn’t a huge deal to carry it into work and leave it in an empty cabinet in my office, but I would also have to carry it into the restaurant or bar if I met up with someone after work so it wouldn’t get stolen. Someone could theoretically use a screwdriver to remove my bike basket now, but it would be much more difficult. And replacing the $25 basket wouldn’t hurt as much as purchasing another fancy $80 pannier. –An upright, dutch style bike, with dynamo (bike powered, not battery) lights, and a chain case (to avoid getting grease on pant legs). This means less fiddling with lights and clothes. –Doppler radar (accuweather app) on my phone. It rarely ever rains all day and if I can see when storms are coming, I can try to leave early or late to work around it. –I keep several blazers on the back of my office door and a few pairs of heels under my desk. In the summer, I wear dresses or a “base” outfit of ankle length skinny pants and a shell or tank top, then throw on a blazer and heels at work. I end up having a bit of a “work uniform” in the summer but that isn’t a problem for me. In the winter I just wear normal work clothes and warmer boots, then change into better shoes at work. –I don’t ride as fast or as hard as I do when I’m riding for exercise, so I don’t get as sweaty. This is less of a problem now that I have an e-assist bike but when I didn’t, I kept baby wipes at my desk for very hot days. –Consider an e-assist bike. It really takes the edge off of hills and sweltering hot days. It makes a difference in how sweaty I feel when I get to work. Not necessary but definitely increases the number of hot days I’m willing to ride. And when I want more exercise, I just dial it down or turn it off.